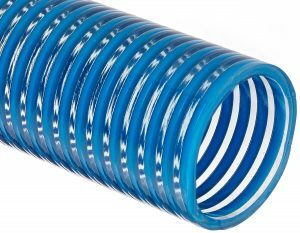 Type 7909B Low Temp Visi-Blue PVC Suction Hose is formulated for improved flexibility in cold weather climates. This general service suction and discharge hose is capable of full vacuum service (at ambient temperature). Operators can view flow blockages and material flow easily to keep equipment and operations running smoothly. Use type 7909B PVC suction hose for all-season agricultural and pump suction and transfer applications. High visibility blue helix is embedded within the wall, tube is smooth clear PVC. This hose is available in a broad range of standard sizes. 7909B suction hose is made from a phthalate free formula.